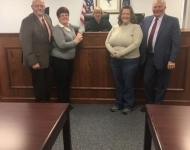 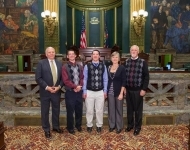 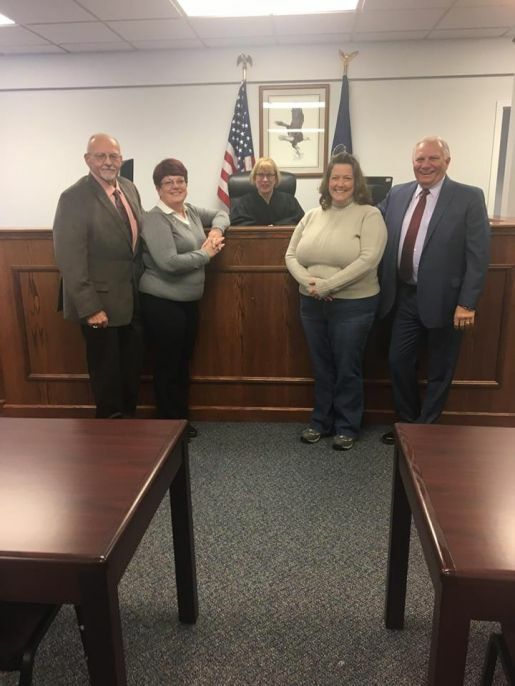 December 31, 2017 - Senator Mensch congratulated Keith Gerhart, Vicki Lightcap, and Lynn Wolfe on being sworn in as Mayor of their respective municipalities (Left to right: Keith Gerhart- East Greenville Borough, Vicki Lightcap - Pennsburg Borough, Judge Catherine Hummel Fried, Lynn Wolfe - Green Lane Borough, and Senator Bob Mensch). 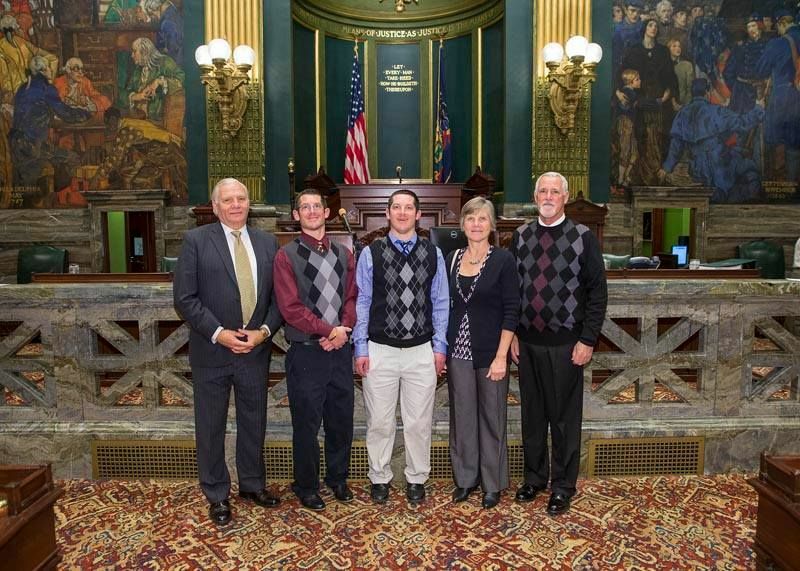 December 12, 2017 - Senator Mensch welcomed and introduced Timothy Ryan, Aaron Ryan, Robert Ryan and Lori Ryan to the Senate. 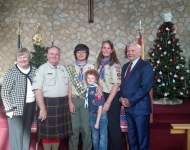 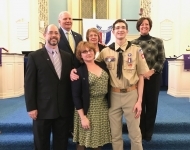 November 25, 2017 - PA State Rep. Kate Harper and Senator Mensch congratulated Jose Dario Hernandez on his Eagle Scout Court of Honor. 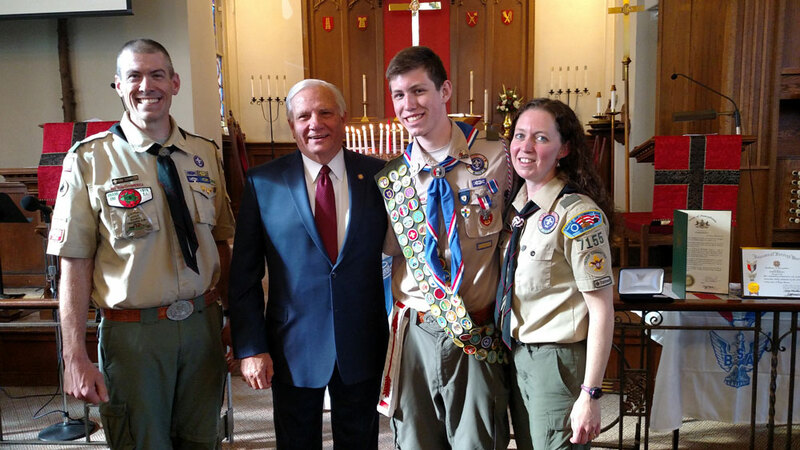 November 18, 2017 - Senator Mensch congratulated Alexander Wilson on his Eagle Scout Court of Honor. 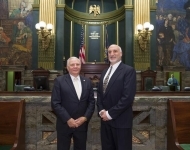 November 15, 2017 - A resolution was offered by Senator Stewart Greenleaf, and it designated November 2017 as Ukrainian Genocide Remembrance Month in Pennsylvania. 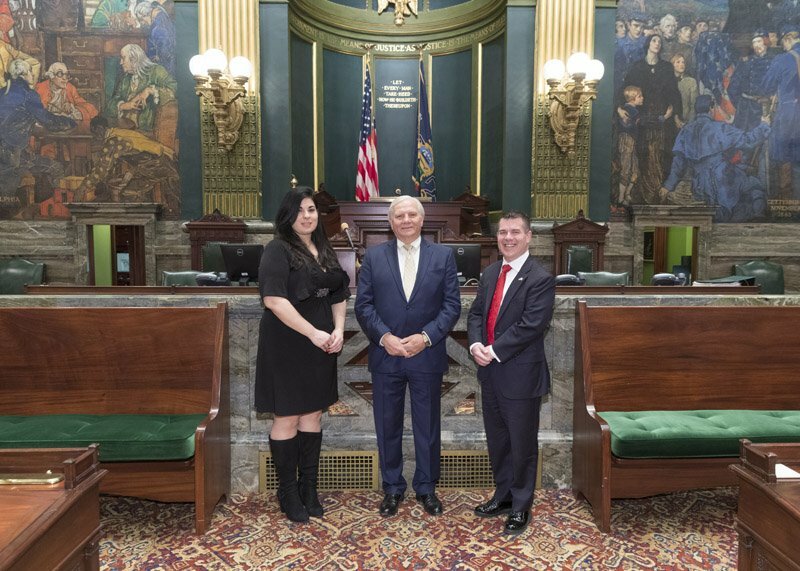 Senator Mensch thanked Ulana Mazurkevich, Michael Sawkiw, & Eugene Luciw from the Ukrainian Human Rights Committee for joining them. 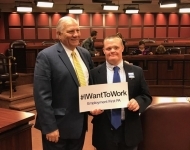 November 14, 2017 - Senator Mensch’s Senate Bill 21 (Employment First Act) was voted out of committee. 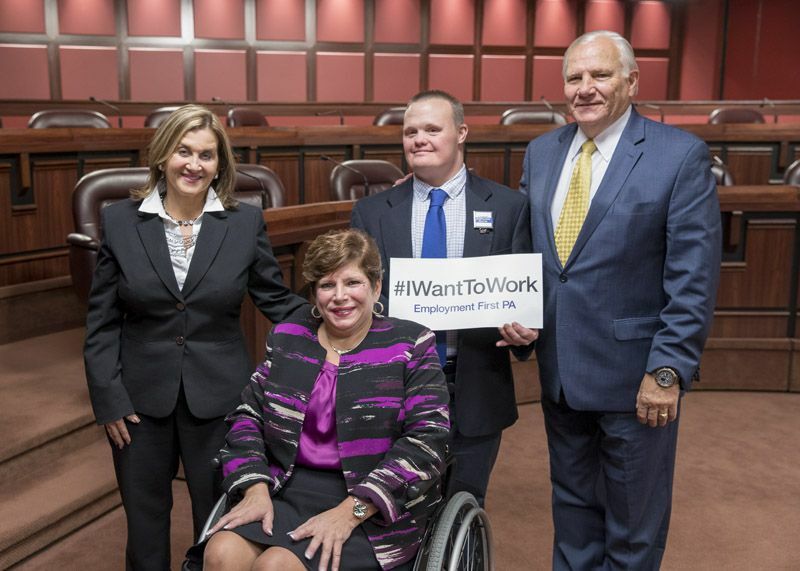 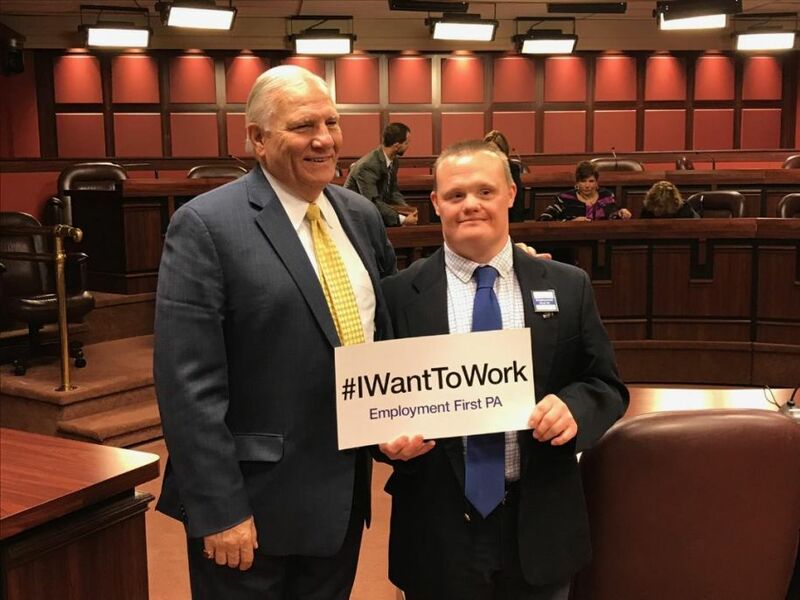 The #EmploymentFirstPA legislation is designed to promote the employment of people with disabilities at competitive wages in Pennsylvania businesses and public agencies. 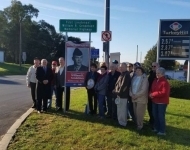 October 27, 2017 – Senator Mensch was honored to join the family of First Lieutenant William R. Gendebien to take a picture at the sign which designates a portion of State Route 100 from Hereford Township at the Lehigh County line through Washington Township in Berks County is hereby designated the First Lieutenant William R. Gendebien Memorial Highway. 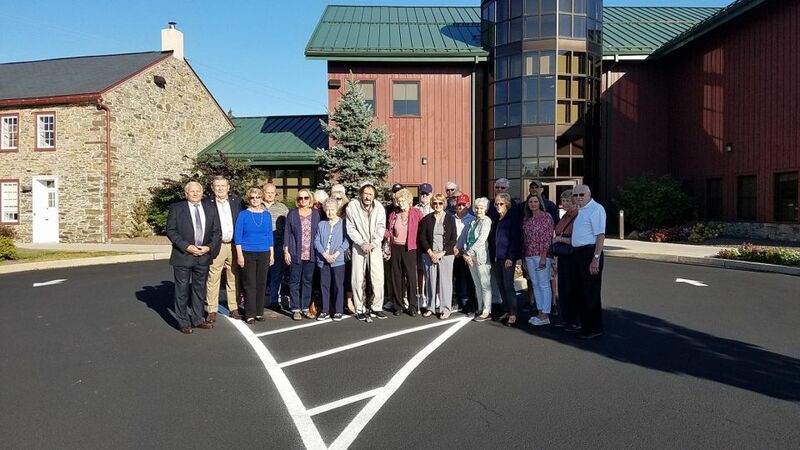 On October 26, 1965, in Quang Nam Province, South Vietnam, VMFA 115 was performing combat operations against hostile forces. 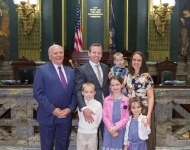 First Lieutenant William R. Gendebien was performing his assigned duty as Air Traffic Controller from an aircraft with the assigned crew in support of VMFA 115 in their combat operations. 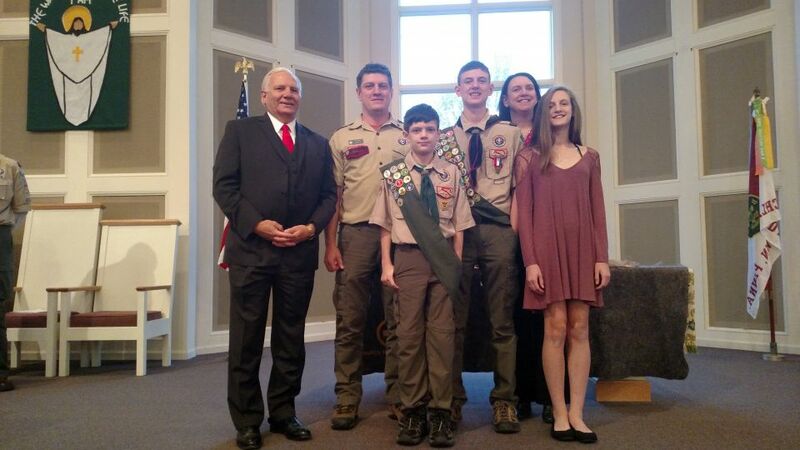 During these operations, hostile actions downed the aircraft with its crew and it made a crash landing. 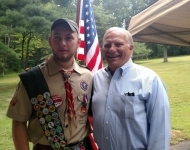 First Lieutenant William R. Gendebien died in the crash of the aircraft. 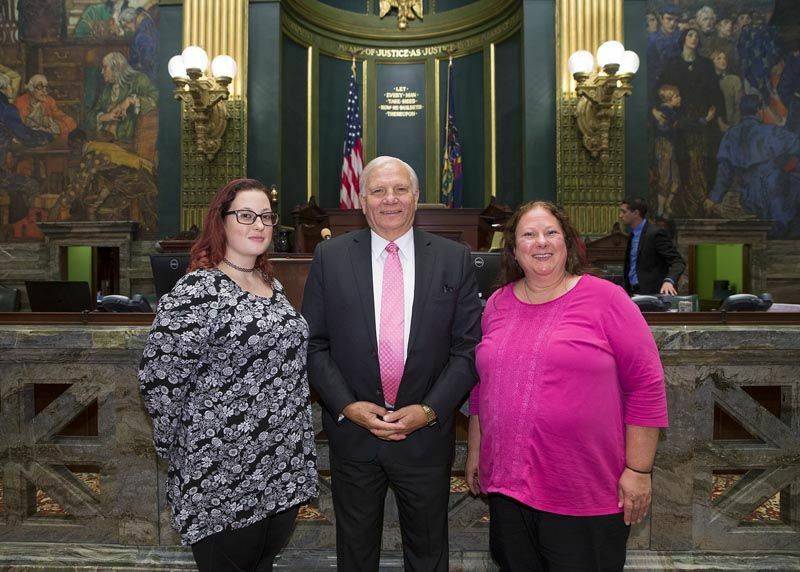 October 24, 2017 - It was my pleasure to introduce Agatha Ann Kriebel and her daughter, Agatha Kriebel, to the PA Senate today. 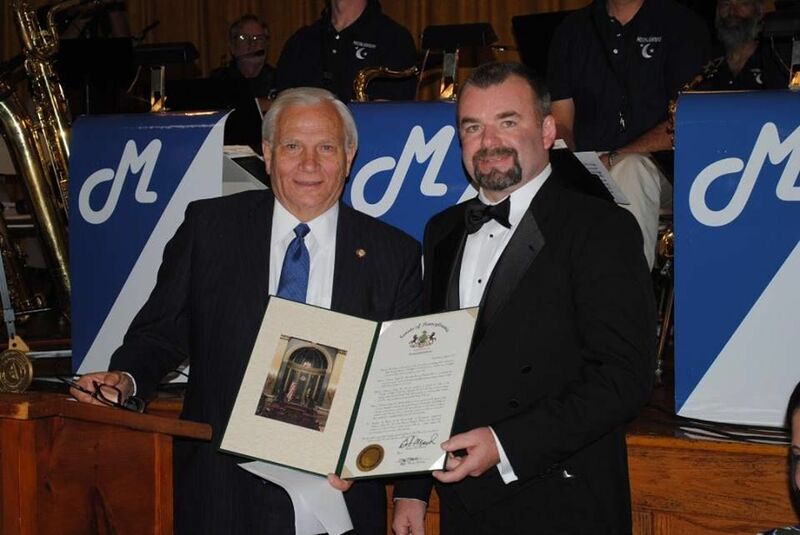 October 21, 2017 - Senator Mensch was honored to present a proclamation to the Perkiomen Lodge No. 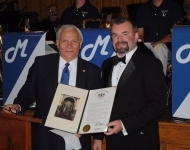 595 of the Free and Accepted Masons for their 125th anniversary. 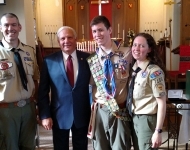 The Perkiomen Lodge No. 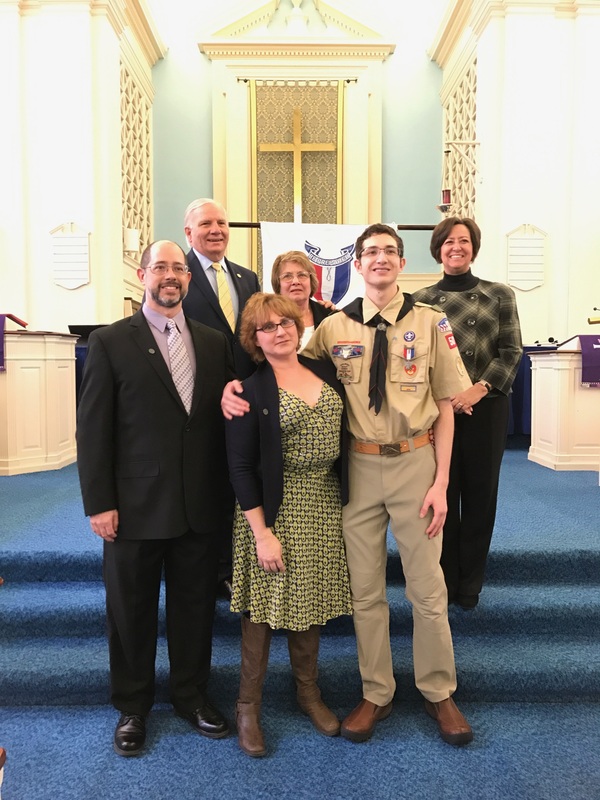 595 has developed a strong reputation for the highest quality of service throughout its history. 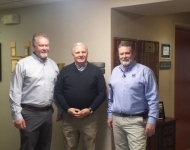 By steady adherence to the principles of reliability and integrity, it has become a leader in the community and a model that is worthy of emulation. 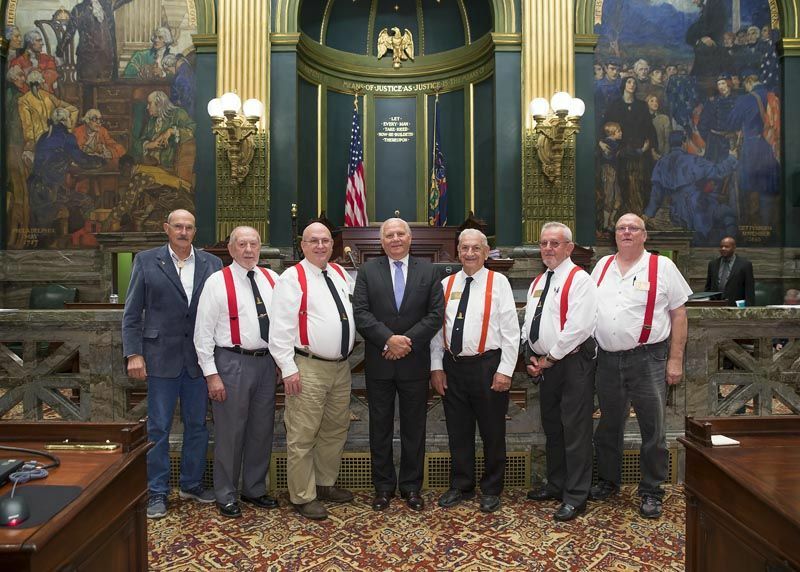 October 17, 2017 Senator Mensch introduced guests from the Grundsow Lodsh Nummber Sivva (Groundhog Lodge Number Seven). 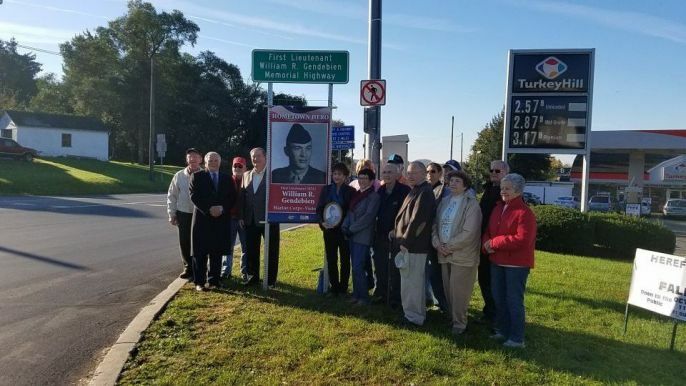 October 5, 2017 - Senator Mensch was honored to meet with the family of Army Specialist Ray Ira Haas and take a picture with them near the sign that honors Army Specialist Ray Ira Haas’ service. 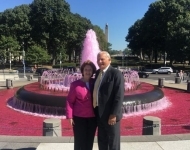 On March 28, 1968, in the Quang Tri Province, South Vietnam, Army Specialist Ray Ira Haas was performing his assigned duty as an infantryman on the battlefield. 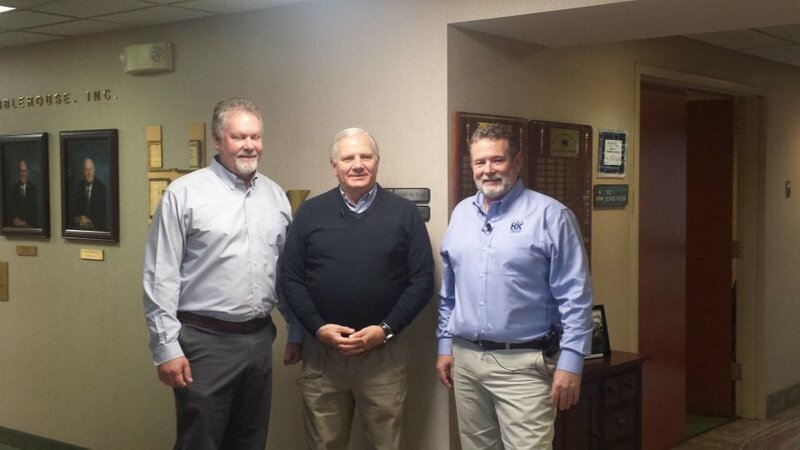 During these operations, Army Specialist Haas and his infantry came under fire. 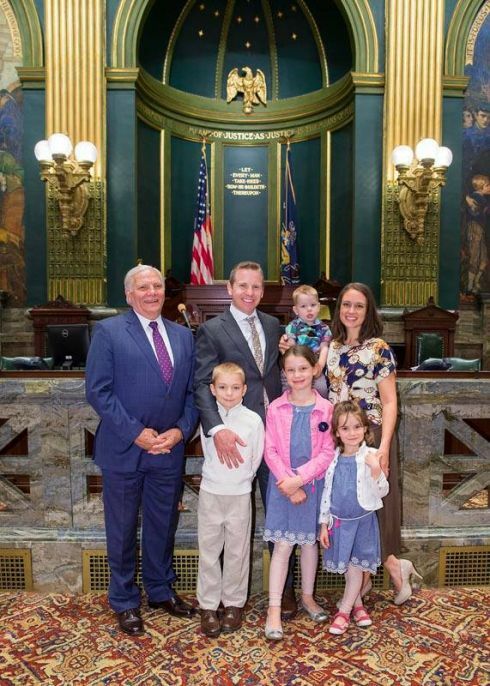 Army Specialist Haas fought bravely and was mortally wounded during the firefight, later being pronounced dead at a hospital in Vietnam. 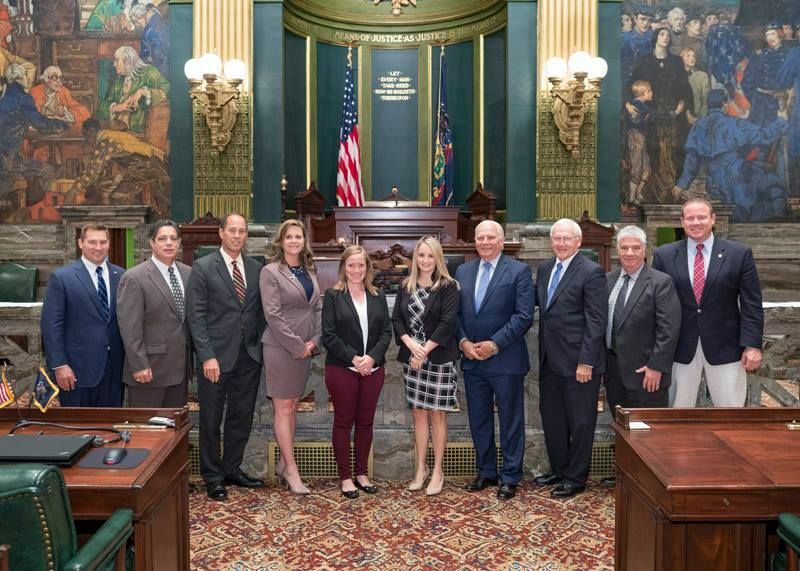 Senator Mensch introduced SB 1219 during the 2015-16 session which was enacted and is now Act 159 of 2016. 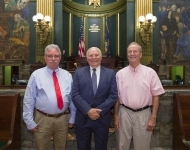 This Act designates a portion of State Route 663 from the Bucks County line, through Pennsburg Borough to the end of Upper Hanover Township in Montgomery County, as the Army Specialist Ray Ira Haas Memorial Highway. 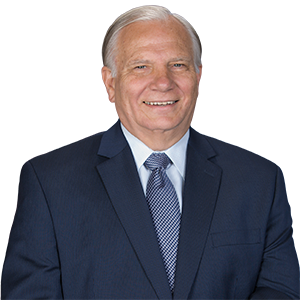 On March 28, 1968, in the Quang Tri Province, South Vietnam, Army Specialist Ray Ira Haas was performing his assigned duty as an infantryman on the battlefield. 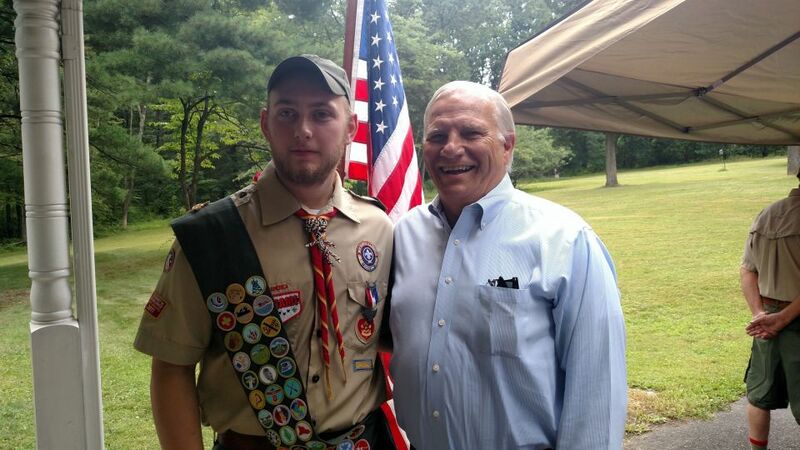 During these operations, Army Specialist Haas and his infantry came under fire. 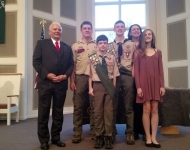 Army Specialist Haas fought bravely and was mortally wounded during the firefight, later being pronounced dead at a hospital in Vietnam. 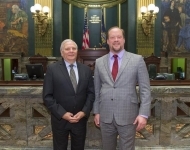 Senator Mensch introduced SB 1219 during the 2015-16 session which was enacted and is now Act 159 of 2016. 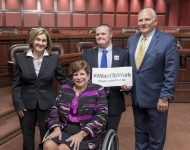 This Act designates a portion of State Route 663 from the Bucks County line, through Pennsburg Borough to the end of Upper Hanover Township in Montgomery County, as the Army Specialist Ray Ira Haas Memorial Highway. 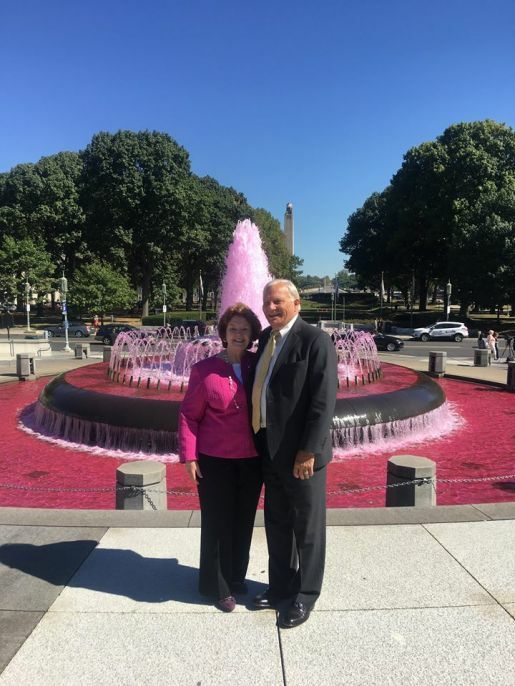 October 2, 2017 - Senator Mensch participated in PA Breast Cancer Coalition's kick-off for breast cancer awareness month which took place at the Capitol Fountain. 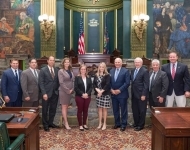 September 20, 2017 - The Senate considered a resolution, sponsored by Senator Joe Scarnati, designating September 2017 as "Hunger Action Month" in Pennsylvania. 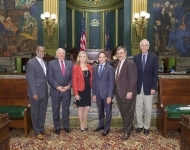 Senator Mensch was pleased to cosponsor this measure and share my support. 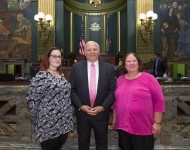 Also pictured is Jane Clements-Smith from Feeding Pennsylvania and Erin Smith Wachter from the Pennsylvania Food Bank. 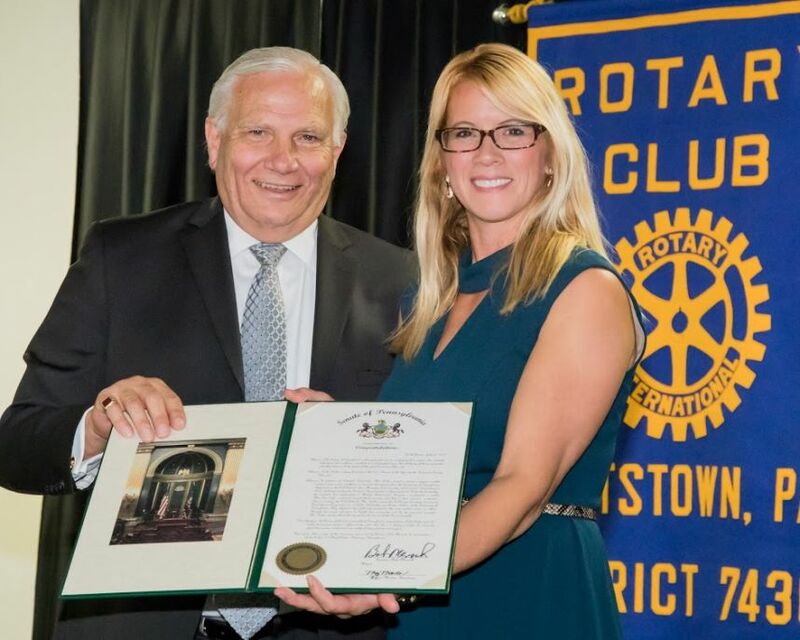 September 13, 2017 - Senator Mensch recognized Twila Fisher who was named Pottstown Rotary's Person of the Year. 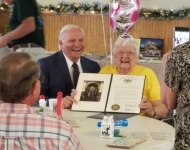 Twila was honored for her exemplary service and citizenship to the Pottstown community. 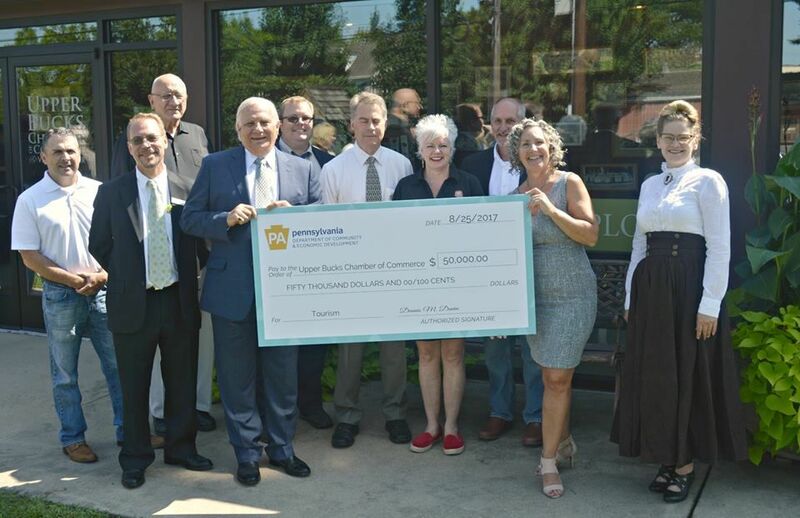 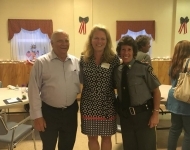 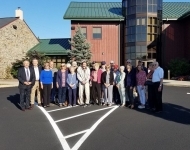 August 28, 2017 - Senator Mensch attended the UBCC - Upper Bucks Chamber of Commerce and Visitor’s Center’s Open House and recognized their grant award from the Department of Community and Economic Development. 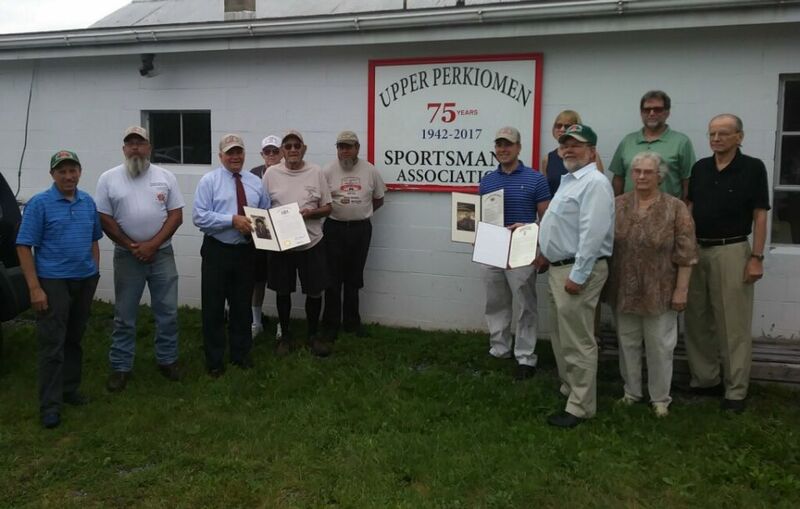 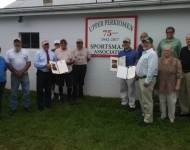 August 14, 2017 - Senator Mensch presented the Upper Perkiomen Sportsman Association with a Senate proclamation recognizing their 75th anniversary. 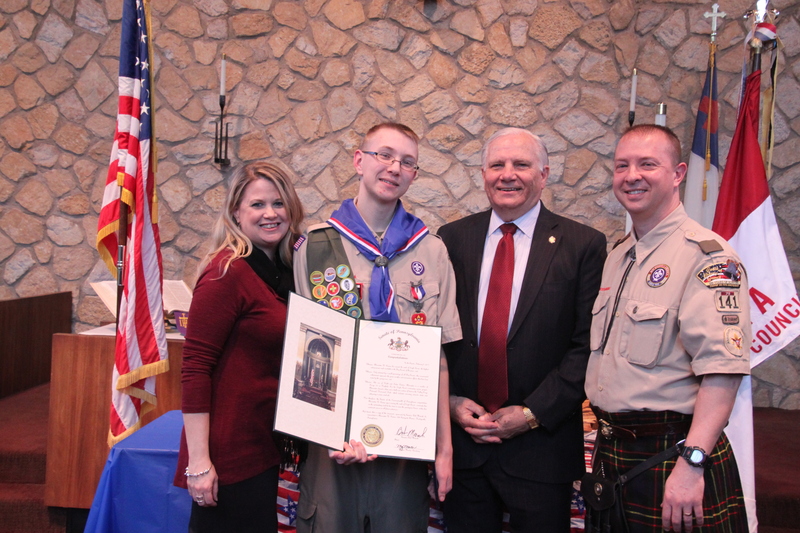 August 13, 2017 - Senator Mensch presented Aaron Doremus with a Senate proclamation at his Eagle Court of Honor. 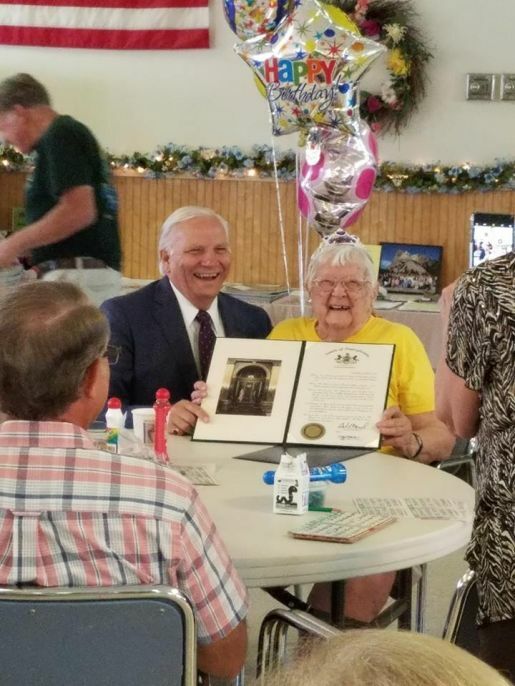 August 4, 2017 - Senator Mensch wished Alma Slotter a very happy 100th birthday. 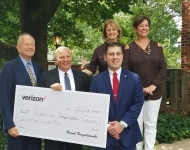 July 28, 2017 - Senator Mensch congratulated the Upper Perkiomen Valley Chamber of Commerce / PerkUp on receiving $10,000 from the Verizon Foundation. 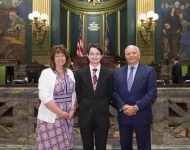 June 27, 2017 - Senator Mensch welcomed Mr. Nick Cardillo, a current intern in his district office, and Nick’s mother Renai to the Senate during their visit to Harrisburg. May 23, 2017 - Senator Mensch enjoyed hosting and introducing the Senate Guest Chaplain, Pastor Kris Wint, and his family. 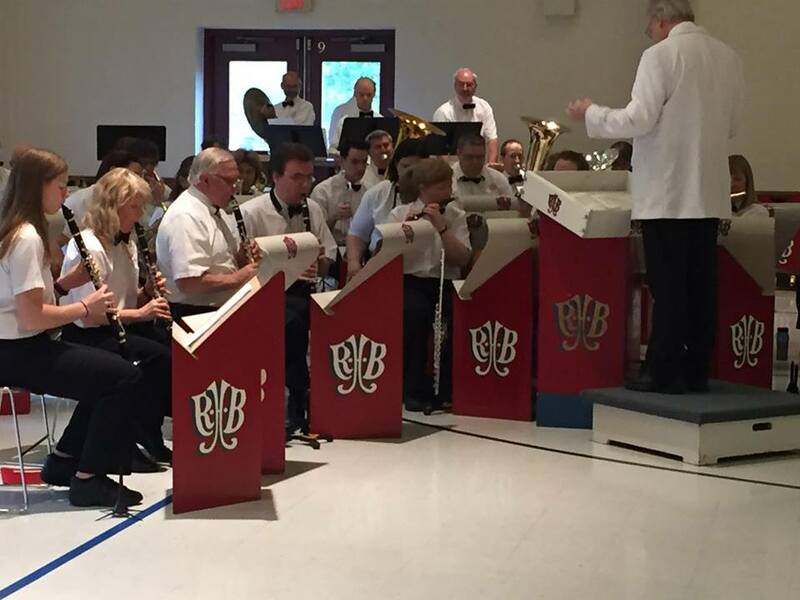 May 13, 2017 Senator Mensch performed with the Red Hill Band during the 6th Annual PA Hometown Hero Walk in Lansdale, PA.
May 12, 2017 Senator Mensch was honored to congratulate Sgt. 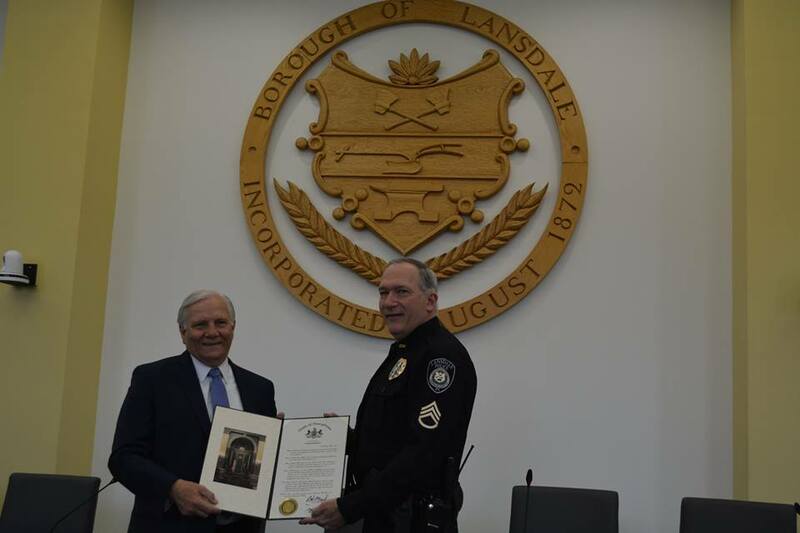 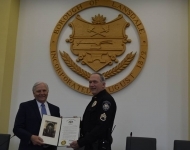 Dean Miller on his 30 years of service at Lansdale Borough Police Department. 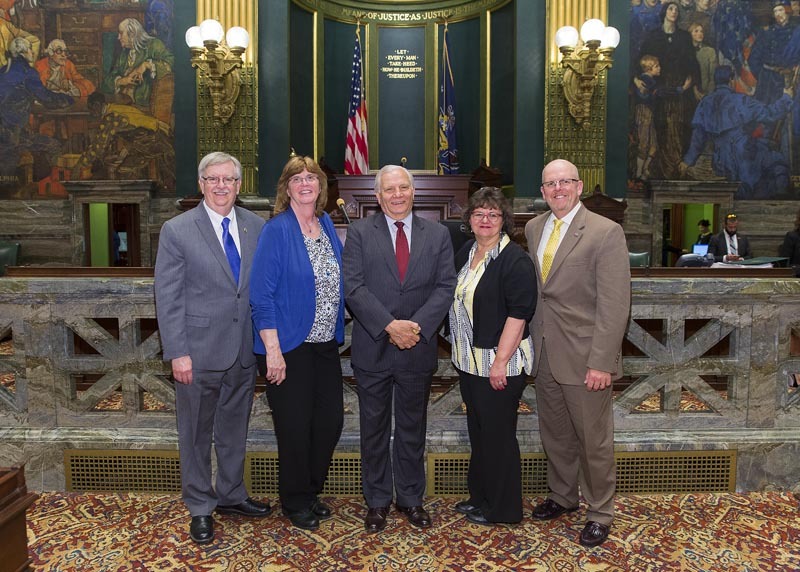 May 9, 2017 - Senator Mensch welcomed and introduced the Guest Chaplain of the Senate , Mr. Brad Mellon, along with his wife Marilyn, and their friends Bryan and Darlene Finnemeyer. 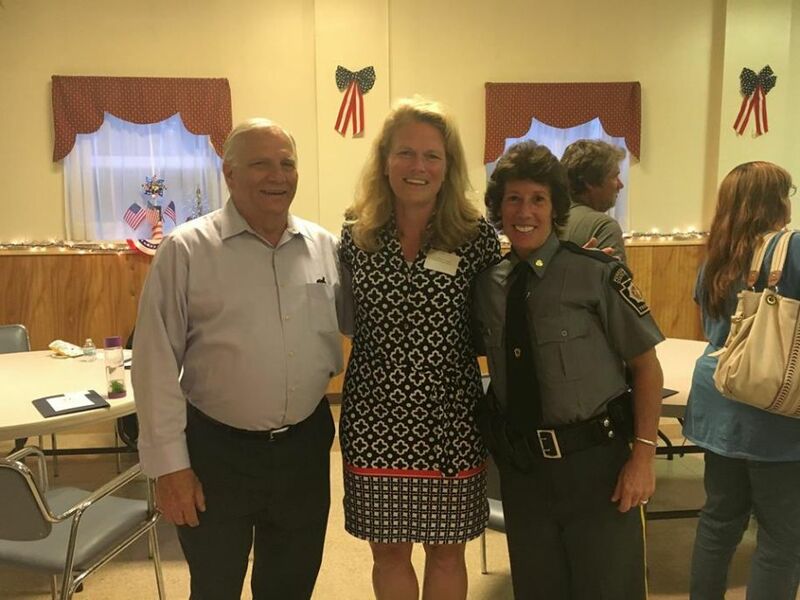 May 5, 2017 Senator Mensch hosted a Coffee with your Senator event at Perkiomen Township building. 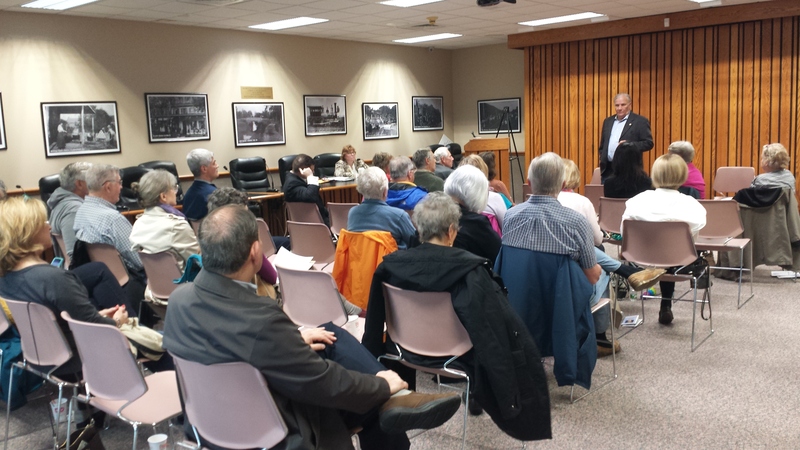 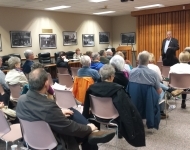 The event was well attended and the constituents were able to discuss a myriad of state-related matters. 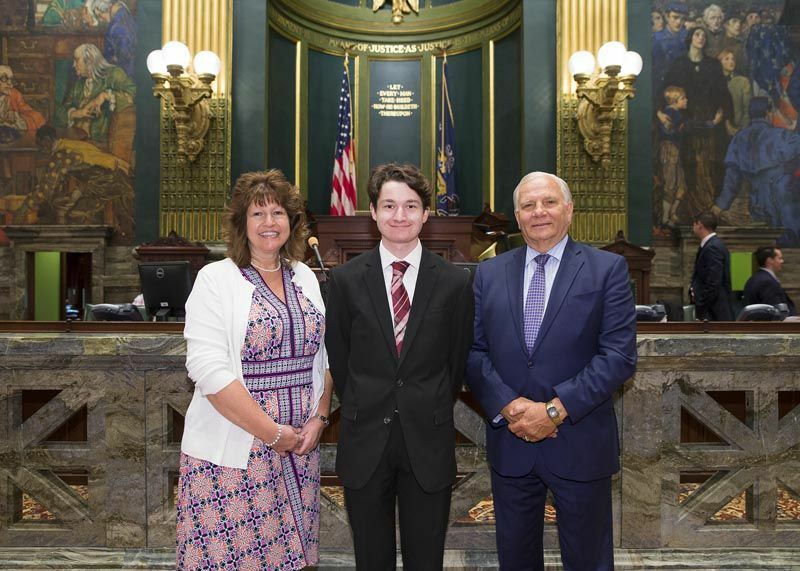 April 26, 2017 - Senator Mensch welcomed and introduced Mr. Edmond Matten and Mr. Thomas Ashman to the Senate during their visit to Harrisburg. 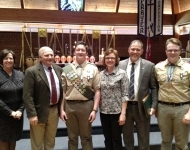 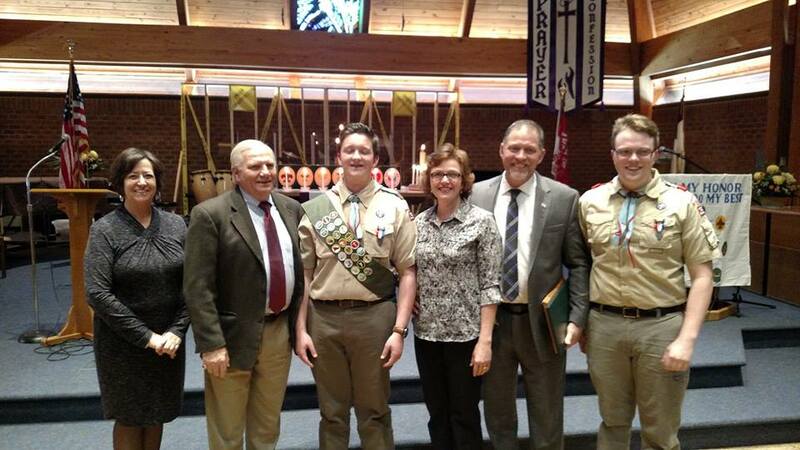 April 10, 2017 - Senator Mensch attended Nathan Schaefer’s Eagle Court of Honor at Jerusalem Lutheran Church. 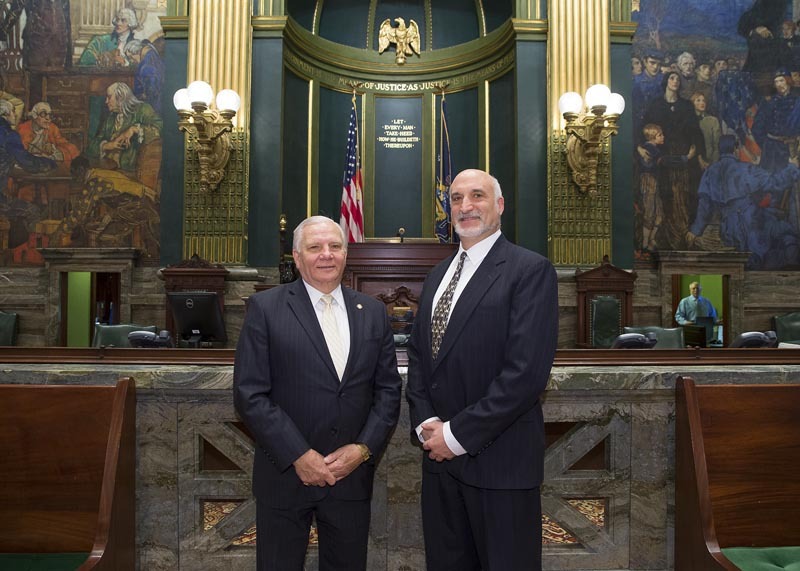 March 29, 2017 - Senator Mensch hosted the Guest Chaplain, Dr. Jim Arcieri, in the PA Senate. March 26, 2017 - Senator Mensch attended the Eagle Court of Honor for Alexander Rainer. 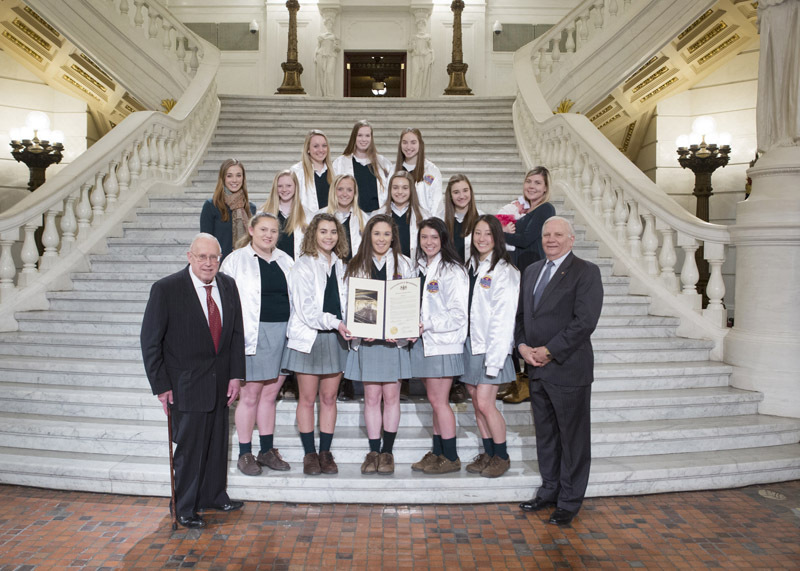 March 20, 2017 - Senator Mensch congratulated the Lansdale Catholic High School Varsity Cheerleading Squad on winning first place in the Small Varsity Game Day Division of the 2017 Universal Cheerleaders Association National High School Cheerleading Championship! 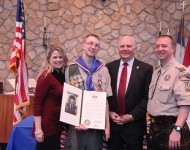 March 13, 2017 - Senator Mensch congratulated John William Houser on his Eagle Court of Honor. 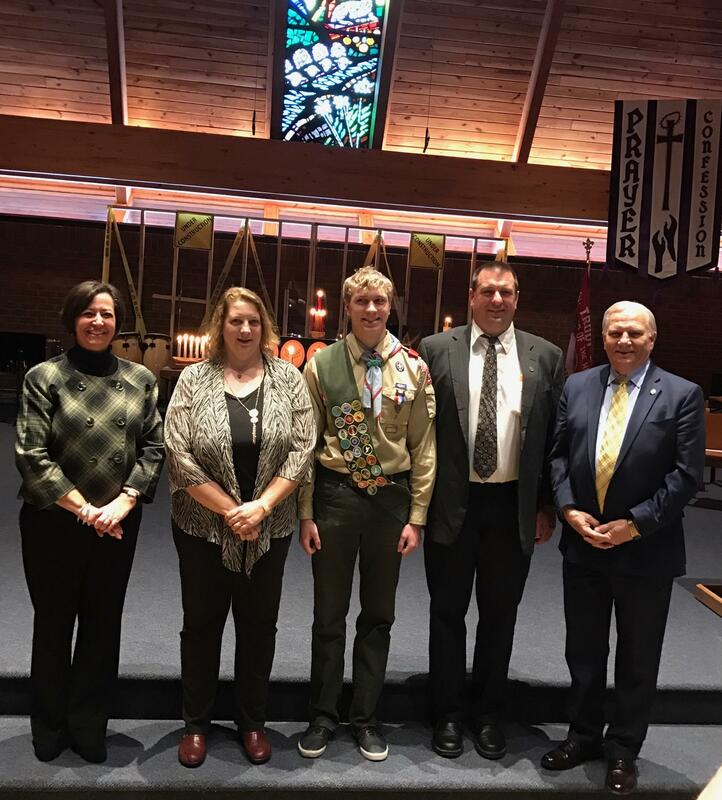 March 13, 2017 - Senator Mensch congratulated Alex Longacre on his Eagle Court of Honor. 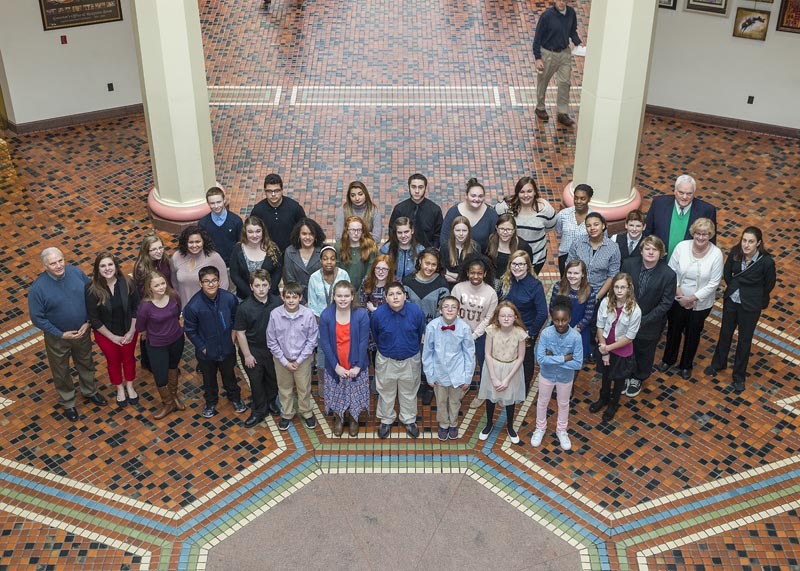 March 10, 2017 – Senator Mensch welcomed the Pottstown MS/HS Woodwind & Brass Ensembles to Harrisburg as part of the Music in Our Schools Month Capitol Concert Series. 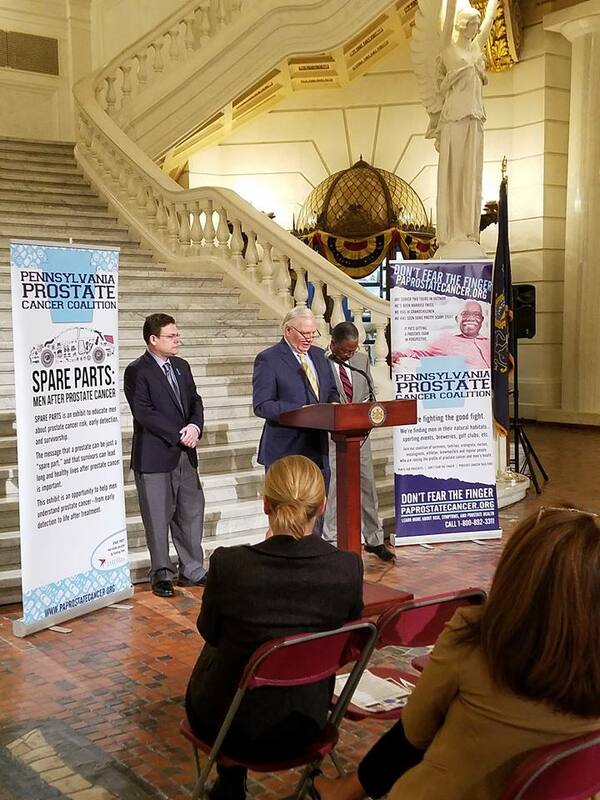 March 7, 2017 - Senator Mensch joined the Pennsylvania Prostate Cancer Coalition in the Capitol Rotunda to focus on the final report generated by the Prostate Cancer Task Force. 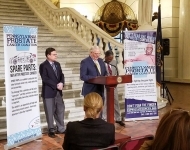 The Task Force was created due to Act 66 of 2015 which Senator Mensch sponsored. 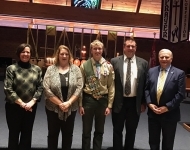 March 6, 2017 - Senator Mensch congratulated Kyle Grater on his Eagle Court of Honor. 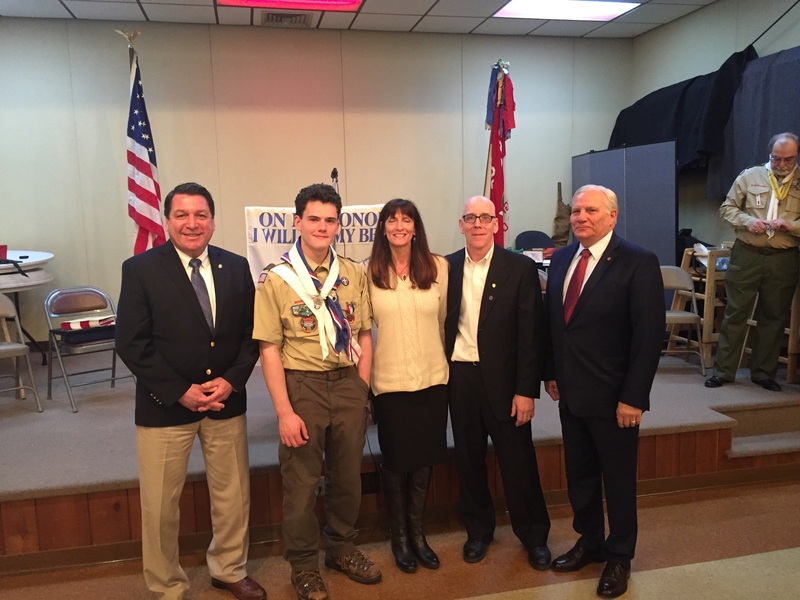 February 19, 2017 - Senator Mensch was honored to attend Zack Boyd's Eagle Scout COH. 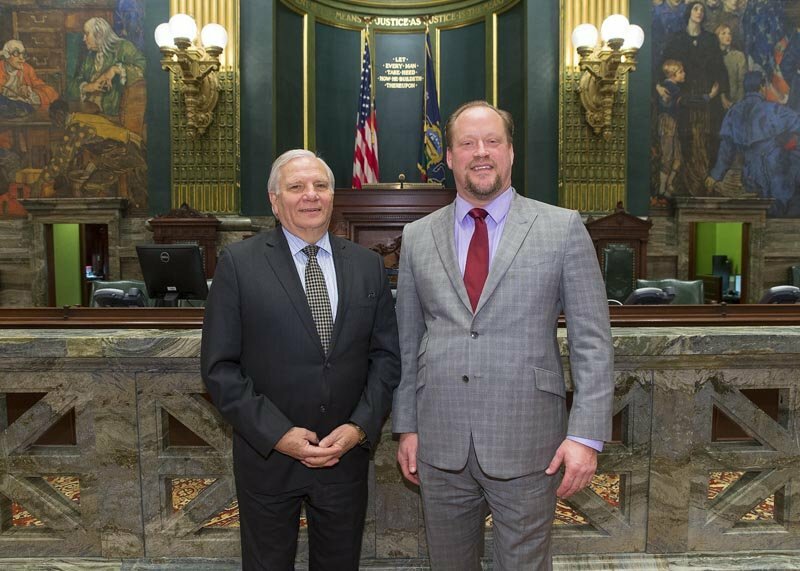 February 15, 2017 - Senator Mensch had an opportunity to visit North Penn School District and meet with Mr. Mike Boyer who is Chair of the Technology and Engineering Education Department. 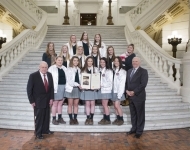 The Technology and Engineering Education program at NPHS is extremely advanced and offers a variety of impressive programs and educational opportunities for students. 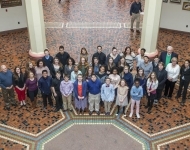 In the Engineering Design and Development course of the Engineering Academy is unique program, developed by Boyer, called The Future is N.E.A.R. 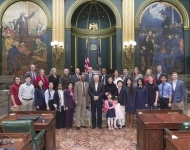 which stands for Nanotechnology Education and Research. 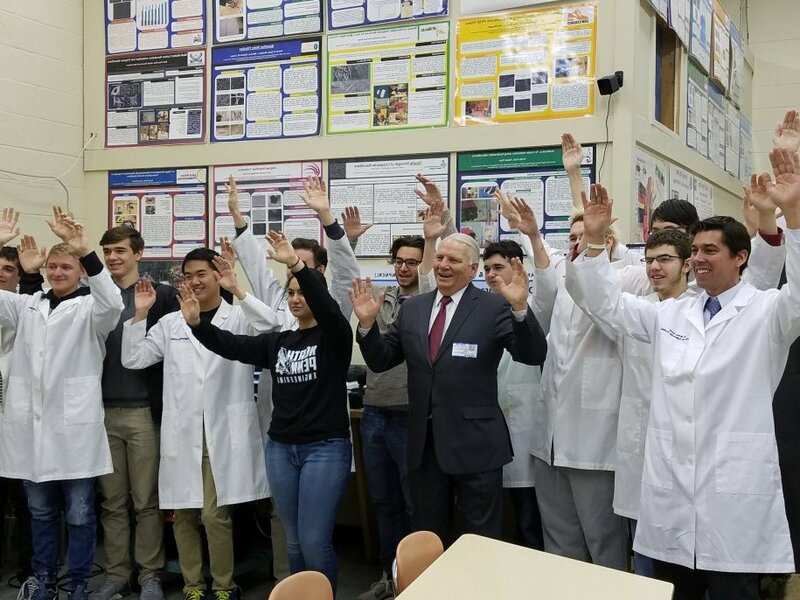 Mr. Boyer’s students from the Engineering Design and Development course were recently invited to present their nanotechnology and engineering research at an International Science Conference at St. Paul's School in London this coming March. 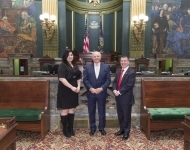 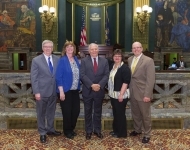 Senator Mensch welcomed France Krazalkovich and Kristen Casey to the Pennsylvania Senate. 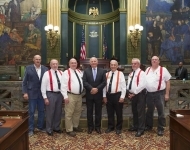 You can listen to their introduction here. 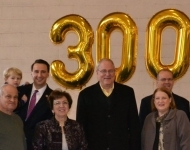 January 28, 2017 - Senator Mensch attended the Borough of Trappe’s kick-off event which marked the beginning of a year-long celebration of their 300th anniversary. 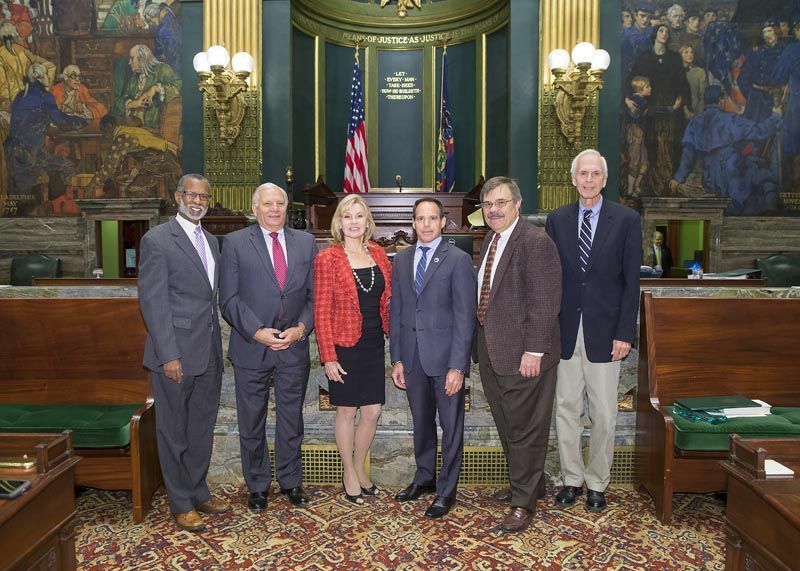 Pictured in no particular order: Mr. Scott Martin, Mr. Stu Strauss, Congressman Ryan Costello, Mayor Connie Peck, Mr. Nevin Scholl, PA State Rep. Tom Quigley, Ms. Pat Webster, and Senator Mensch. 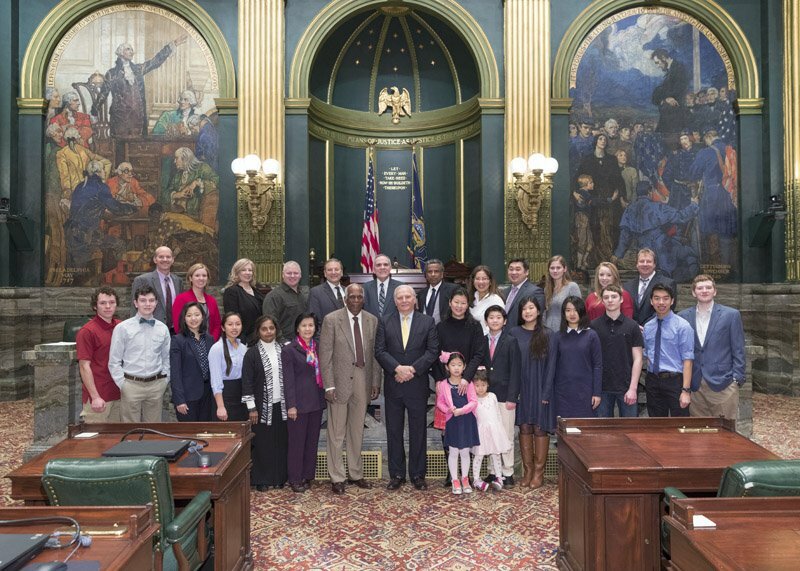 January 24, 2017 -Senator Mensch introduced the members and student volunteers from the International Spring Festival to the Senate of Pennsylvania. 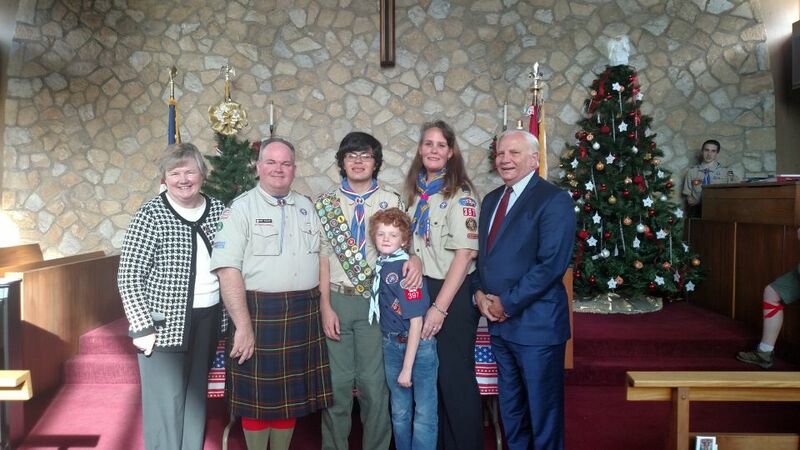 Watch their introduction here. 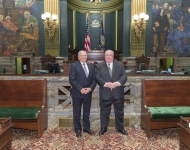 Listen to their introduction here. 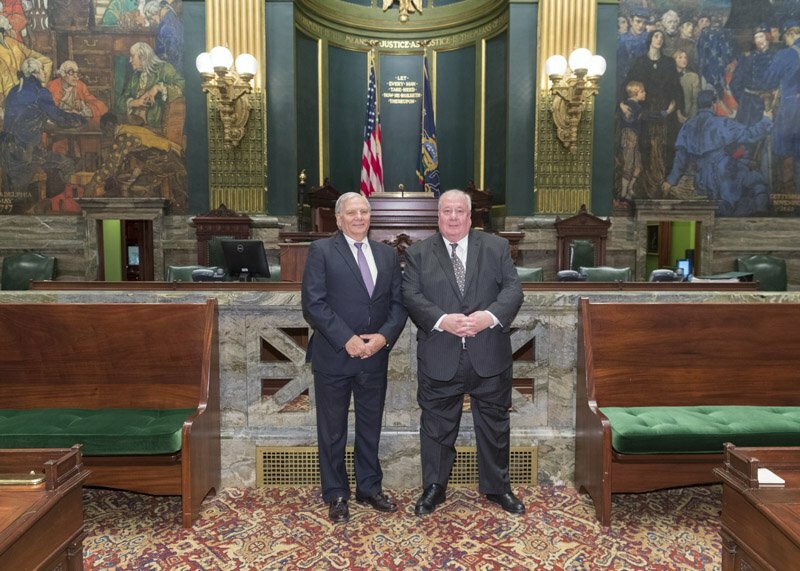 January 23, 2017 - Senator Mensch introduced Mr. Steven Diehl to the Senate of Pennsylvania. 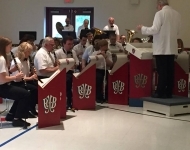 Watch their introduction here. 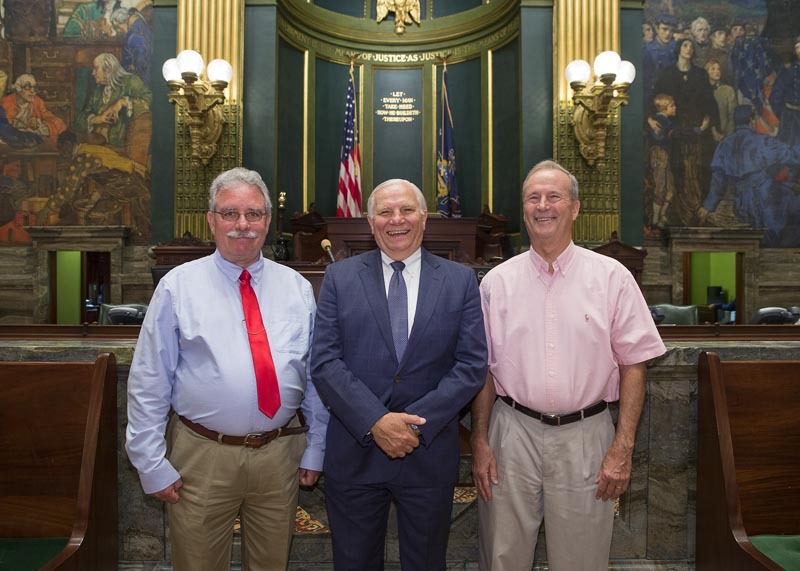 Listen to their introduction here.